Energy Skate Park is a simulation from the GoLabz project. The simulation introduces the basics of energy conservation. We have given students age 10-12 some tasks while using this simulation. See below. Find out about a skate boarder and design a skate park on Energy Skate Park simulation. Does the weight of the skater influence his/her speed?If yes, how? How does the size and weight of the skater influence the total energy? What does the bar graph tell you about energy? 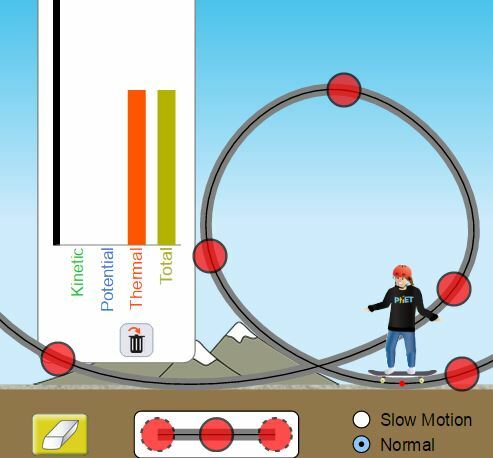 Use the bar graph to find out what is meant by kinetic energy and potential energy? The skater continues endlessly? How is this possible? Is this realistic? Why/why not? What kind of energy is related to friction? Does friction have (1) a larger, (2) a smaller, or (3) the same impact on a big skater than on a small skater? Match the concepts in the first column with the correct sentences in the second column. 1. speed A. When the skater is at the top of the track …… energy is highest. 2. friction B. The skater’s weight does not influence the speed. 3. mass C. When still moving the skater has ………… energy. 4. kinetic energy D. The skater is moving faster in the beginning. 5. potential energy E. On a smooth track the skater will go faster. 6. thermal energy F. At the end of the skating tour all energy has been tranferred into heat. For correct answers see bottom. Design a skate track whereby the skater makes a salto and does not fall off the track. Present the skate track to your classmates and explain what you have done to reach your goal.